The CBM Motorsports billet aluminum LS valve cover kit will give your Chevrolet LS series engine a performance upgrade over stock and a totally new look. CNC machined out of a solid block of 6061- T6 aircraft grade aluminum insures a superior fit and seal opposed to the cast covers that are plagued with fitment and leak issues. These valve covers were designed for use in an application where the ignition coils are mounted in a remote location. These valve covers will fit GM LS1, LS2, LS3, LS6 and LS7 style cylinder heads. 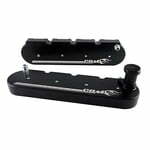 2 black anodized billet valve covers. 1 black anodized oil filler neck with threaded style cap. 8 center bolts and grommets. 2 rubber valve cover gaskets. Valve Cover Top Style: Ribbed with logo. Fits GM LS1, LS2, LS3, LS6 and LS7 style cylinder heads.